COLUMBUS — The Ohio governor’s race is coming down to the wire. With just a few days left until the election, Republican Mike DeWine and Democrat Richard Cordray are nearly tied in recent polls. Both candidates are well-seasoned and experienced in state government. He’s the old guard among politicians in Ohio and has served as Greene County prosecutor, state senator, U.S. representative, lieutenant governor, Ohio attorney general and U.S. senator. 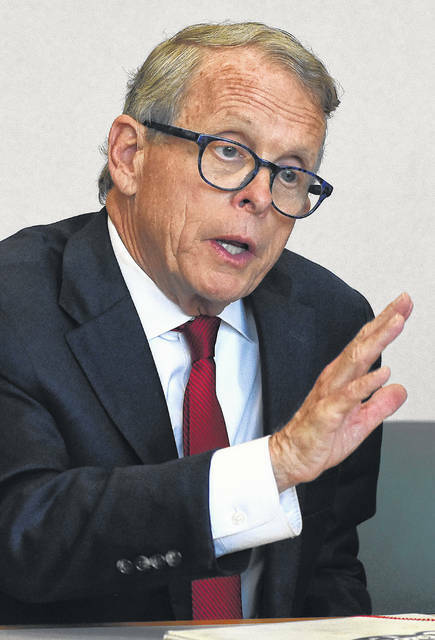 Mike DeWine, 71, Ohio’s current Attorney General, is seeking a four-year term as governor. The Cedarville Republican believes there’s still much more he can do for Ohio. “I have a real passion to do this. I truly believe I’m the best prepared person to do this. Throughout my career, I’ve brought people together. I think the job of the governor is to bring people together to focus on problems to work on those problems. I do a good job fixing problems, and I’m just very excited about the prospect of doing that. I’m a good listener. I’ve traveled the state probably more than anybody, besides truck drivers, in the last three decades or so. There’s not a day that goes by that I don’t learn something and talk with someone who tells me something I don’t know, and that’s what I think a governor is supposed to do. A governor is supposed to listen,” said DeWine. DeWine points to two major issues he’s concerned about. “When you talk to employers, the No. 1 complaint today is, ‘I can’t find people to work.’ Two reasons: one is a drug problem, one is a skills gap. If you look at the five or six programs we’ve laid out, they focus on this. Let’s take the drug problem, first of all. I have a comprehensive 12-point plan. There’s nothing magical about it, but it all takes things that will work or are working — the drug courts, for example. They work. Probably the most important of the 12 points is education and prevention. The evidence shows if you start in Kindergarten and do something every single year, K-12, in regard to prevention, you will fundamentally change outcomes. We’re not doing that very much. We’re doing a DARE program here, something else here. Those are all fine, but if you really are serious, you’ve got to do something every single year,” said DeWine. DeWine’s concern about the skills gap lies with improving the state’s schools. “The most important thing, as far as I’m concerned, is the teachers and the quality of the teachers and the training of the teachers, and that’s going to be really what I would focus on. If you look at the skills gap problem, our goal should be that every child graduates from high school, truly college ready or [on a] pathway to a career. We have some amazing career centers in Ohio today. Our goal is to take it to the next level, to make sure we have the best career centers we can have in the state and they have the best equipment,” said DeWine. He’s an undefeated five-time “Jeopardy!” champion, accomplishing that feat in 1987, but he’s much more than that. Richard Cordray, 59, from Grove City, has been a member of the Ohio House of Representatives, Ohio solicitor general, Franklin County treasurer, Ohio treasurer, Ohio attorney general and the first director of the Consumer Financial Protection Bureau under Presidents Obama and Trump. Cordray also focuses on the economy as one of his biggest priorities. “I’ve pretty much taken my priorities from what people have told me around the state, and what they’ve tell me is that even though the economy is good in some respects, unemployment is relatively low and the stock market’s been high, they have a lot of economic anxiety and wages have been flat for a long time and costs continue to rise. So they’re concerned about healthcare and having somebody who will push to keep healthcare costs down and coverage, make sure it’s reliable. They’re concerned about having the skills and training that they and their children and grandchildren need to compete in the workplace, and [in] many places around the state, people feel like they would like to see opportunities spread out more fairly across the state so that nobody’s left out or left behind and that their voice is often not heard or respected in Columbus. That’s certainly what people think and so those are the things that I’ll make priorities,” said Cordray. Cordray is also concerned about the battle against opioids. “Ohio has sunk way down in the last several years. We’ve gone from about the middle of the states in the death toll to being the worst in the nation, except for West Virginia, and it has risen every year. It’s been at record levels and it rose 20 percent again last year, from 4,000 to 4,900, and it is devastating communities across the state. It seems to me law enforcement has to have a governor that will work with them and drive the fentanyl out of the state. That is the deadliest drug we’ve ever seen on our streets in Ohio, and it is killing people at an alarming rate. There were 70 fentanyl-related deaths a year when I was attorney general, and last year, 3,431 Ohioans died from fentanyl. It is two-thirds of the opioid-related deaths. So we need to be effective at driving that off our streets and driving it out of the state. 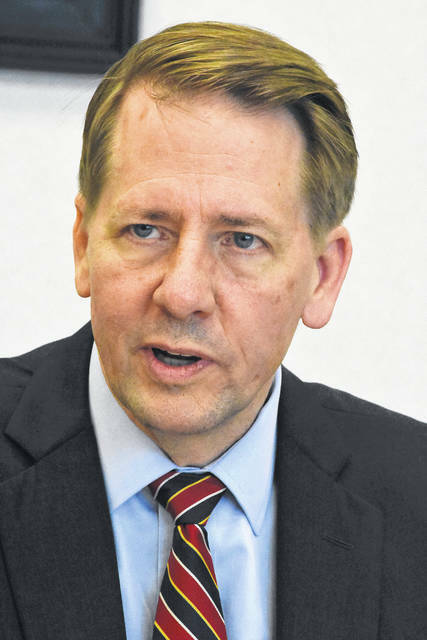 We will use the organized crime commission and other things that I used when I was attorney general to bust drug rings, and that’s important,” said Cordray. Cordray says there needs to be more community treatment available for addicts. “That means to me, in part, getting local government funds back that have been taken to Columbus and held there and not returned to our communities. It’s caused layoffs of safety forces and it’s affected people’s ability to fight the opioid crisis. I think defending the Medicaid expansion is really important because 200,000 Ohioans are getting mental health or substance abuse treatment through that program, so that’s a key issue,” said Cordray. On election day voters will also be able to choose third-party or write-in candidates. • Constance Gadwell-Newton - Green Party. • Travis M. Irvine - Libertarian. • Rebecca Ayres - write-in. • Richard Duncan - write-in. • Renea Turner - write-in.